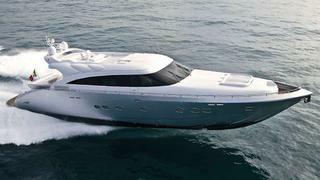 AB motor yacht Evasione for sale with Fipa Group and Aquamarine. News just in from Ivan Adzic at Fipa Group in Cannes that he's jointly listed for sale with Aquamarine the 28m motor yacht Evasione. She is a high-tech yacht built by AB Yachts in Italy in 2008 in advanced composites and with waterjet propulsion. With triple Caterpillar 1,825hp power, she exceeds 50 knots and can cruise at speeds in excess of 40 knots. A fuel capacity of 11,000 litres gives her a cruising range of over 600 nautical miles. She is also a very fuel efficient yacht, as at economical cruising speed of 37 knots she burns 16 litres of fuel per mile which is much more efficient than a traditional yacht of this size. She is also a very comfortable yacht: her beam of 6.45m gives her very good interior volume which allows for four full-sized staterooms for eight guests as well as very comfortable crew quarters for four. Guest accommodation is in a master suite, double VIP stateroom and two twin cabins - all en suite. As she is also registered at under 24m, she could be a good option for someone who is looking to offer his yacht for charter. Located in the South of France, Evasione is asking €2.9 million.